You're engaged & ready to plan one of the most memorable days of your life! The right hairstyle to crown your gown selection is so important. You'll find that our professional stylists are eager to assist you in creating the perfect presentation for such a beautiful event. You can expect to look glamorous & feel confident as you walk down the aisle to your groom. RIAH Hair Studio prides itself on being able to satisfy the unique needs of you and your wedding party. As each bride is different, our creative stylists will consult with you, in a relaxed & fun atmosphere, in choosing the proper hair style and veil combination. Whatever look you prefer, from classic glamour, sophisticated, stylish or avant garde, let them advise and inspire you with their artistic skills! Local or out of town guests, flower girls, ring bearers, grooms, groomsmen, parents of the bride & groom . . . all are welcome! 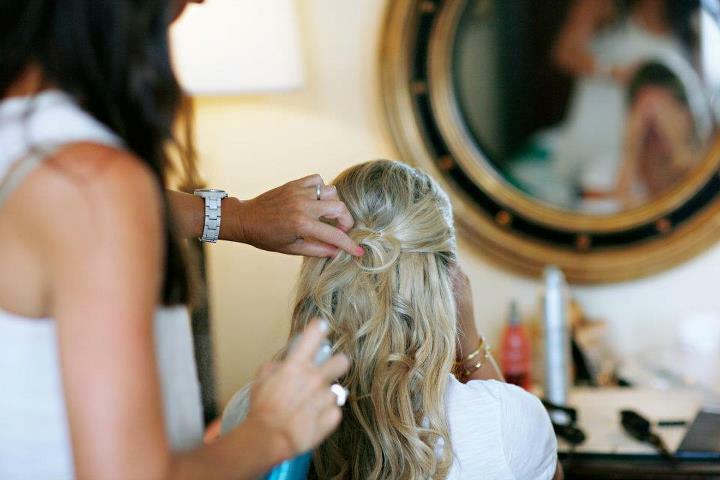 Our team tends to your specific beauty needs as you prepare the details of your day. You'll be sauntering down the aisle, radiant & captivating! If needed, we are also available to come on-site to your ceremony location. Just ask! Are you attending a prom, anniversary, birthday, family or school reunion or elegant dinner party? Our stylists offer simply the best in Special Occasion hair cutting, design & styling in Bucks County! We request that you come in to the salon with clean, dry hair & wear a button-down shirt when receiving a Special Occasion style. On location services are available. Call 215.953.0622 to arrange.